Karijini National Park is located in West Australia's Pilbara. 1400km North of Perth, the closest towns are Newman, Tom Price and Karatha. 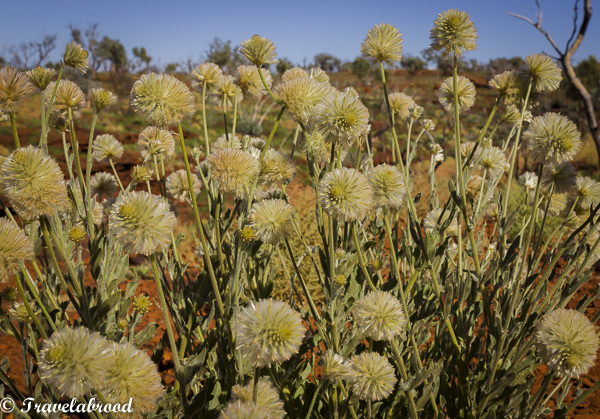 We flew from Perth to Newman where we collected a 4WD and drove the 160km to Karijini. Newman is a mining town, mainly populated by BHP Billiton. Mt Whaleback is the main Iron Ore mine, with Roy Hill (owned by Gina Reinhart) also using the town for accommodation and housing. Flying into Newman over the desert and the red, red earth and not much else is like admiring an aboriginal painting. It is so beautiful and if you have never been to outback WA it is definitely one for the bucket list. 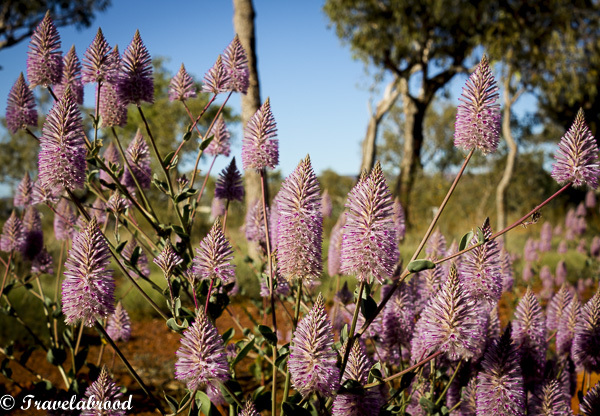 August is also the start of wildflower season and you don't have to go far to see the picturesque flora. 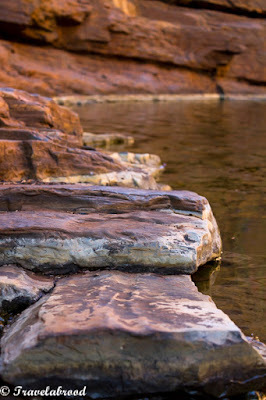 We reached Karijini Eco Retreat just before sunset. 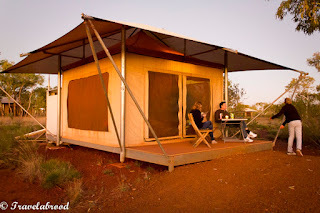 We had booked a couple of Delux Eco tents complete with ensuite for the duration of our stay and booked into the restaurant for dinner each night. The temperature was cool, but not cold and without a cloud in the sky the stars were magical. 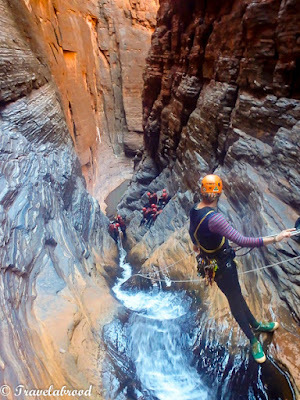 I had previously booked the West Oz Active Red Gorge Adventure with Pete West! Ten of us were collected from the Eco Retreat at 7.30am and we headed over to the West Oz Active HQ where we were kitted out with wetsuit, booties, thermals, helmet, harness and tube. From there it was a short bus ride to Knox Gorge where we started our day of abseiling, rock climbing, tubing and canyoning. It was exhilarating. 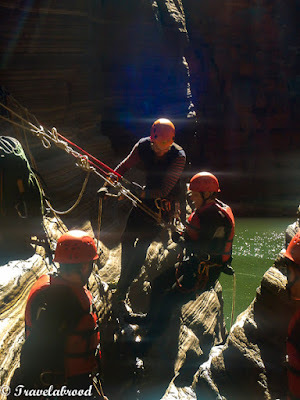 First we waded through chest deep water and were then lowered over a huge bolder only to go shooting off a 4m high waterfall into the pool below. From there we floated on our tubes through Red Gorge and Junction Pool and then pulled ourselves up a waterfall and rock climbed up to Hancock Gorge where we completed our day. We were exhausted by the end and my knees and leg muscles had really had a good workout. Back at HQ we handed back all our gear and headed back to camp for another yummy dinner in the restaurant and early bed. Not in a hurry to go anywhere we had a leisurely breakfast and headed down to Joffre Gorge which can be accessed from the Eco Retreat. This was one of my favourite with the amphitheatre made of rock and the waterfall. 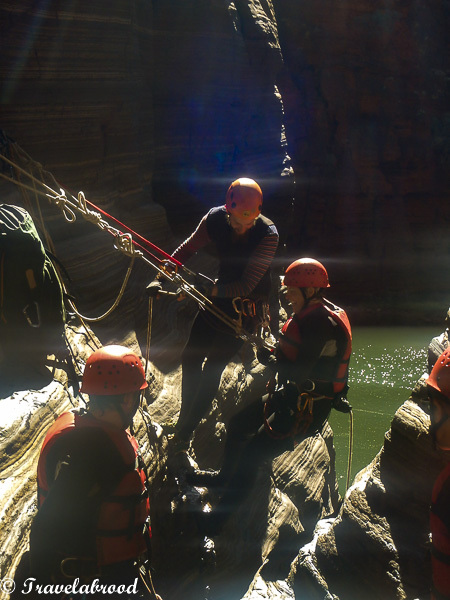 It’s amazing to think that we were the only ones there enjoying the warmth of the sun and natural landscape. 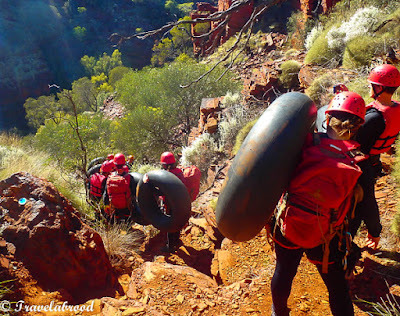 Back up the top and we packed a picnic lunch and headed to Weano Gorge. From here we took the longer route and headed down to Handrail Pool where we stopped for lunch. Handrail Pool was another favourite. 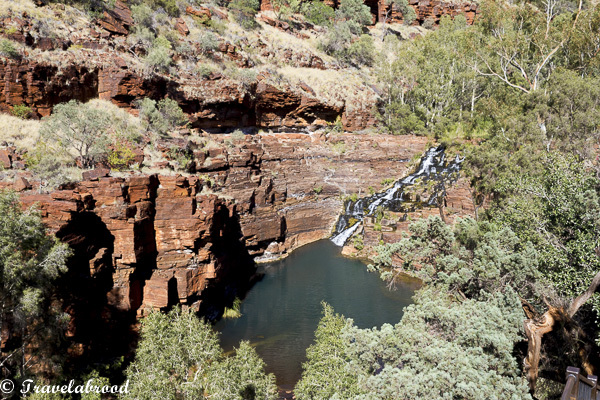 In the summer it would be the perfect place to picnic, swim and spend a day, however in August the gorge doesn't see much sun, so the water and rocks made the gorge very cool. 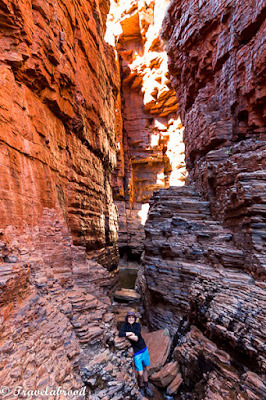 Kalamina Gorge was a really pretty walk mostly in the sunshine. 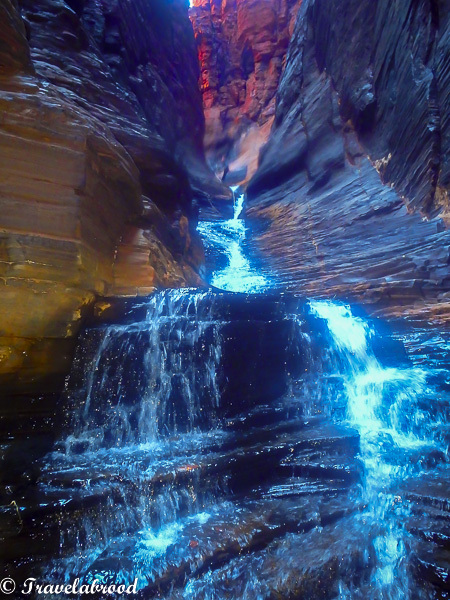 Both children swam under the waterfall and by the time we got back to the car it must have been around 3pm. 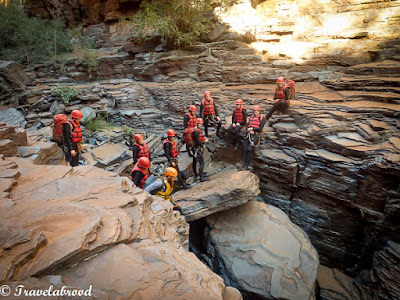 Our last day and with check-out by 10am we packed up and headed over to Dales Camping Area. We stopped in at the Karijini Visitors Centre which had an interesting museum attached. 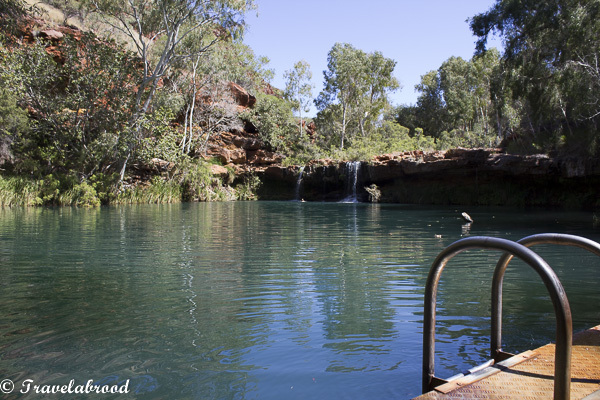 At Fortescue Falls the children had a swim in the beautiful clear water and then we walked through Dales Gorge to Circular Pool. This whole area is stunning and a great day out. I can imagine in peak season it would be very busy with people sunning themselves and having picnics. 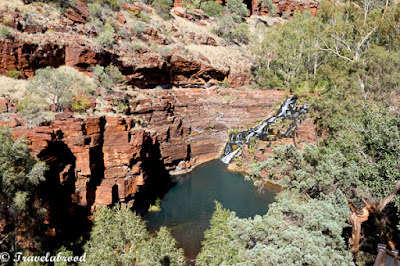 We took the top route back to the car, picked up our lunch and headed back down past Fortescue Falls to Fern Pool. As one lady said “you’ll want Fern Pool in your backyard”. 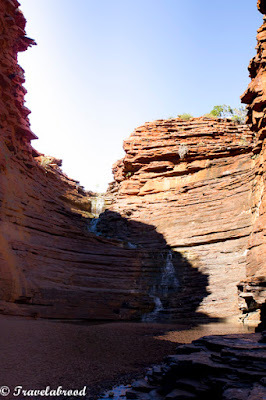 I have to agree with her it was a magical oasis and a perfect way to spend our last hours in Karijini. 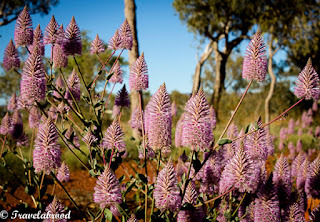 With a flight to catch, we drove back to Newman and toured the town, driving through the new and old parts of town and then up to Radio Hill lookout where we could see over Mt Whaleback mine, the golf course, the town of Newman and beyond to the airport. We had an early dinner at the Capricorn Outback Bar and Grill near the airport and arrived back in Perth around 9pm. A four day retreat in the outback and no communication with the outside world. I think we will do this trip again next year!